Sri Lanka's main opposition party has accused the country's most senior army officer of being behind violent attacks on reporters. 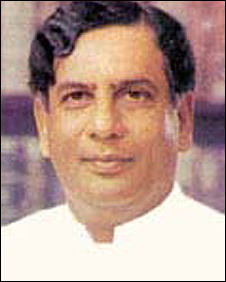 Opposition MP Joseph Michael Perera told parliament that the attacks were carried out by a "special team" controlled by Lt Gen Sarath Fonseka. Mr Perera said the government should arrest the offenders and "immediately bring them to justice". The army has denied that it is any way involved in attacks on journalists. "We are told by those in the army itself that journalists are abducted and subjected to grievous injury by none other than a special unit under the army commander," Mr Perera, a former parliamentary speaker, said. The World Association of Newspapers recently ranked Sri Lanka as the third most dangerous country in the world for media workers in 2007. But army spokesman Brig Udaya Nanayakkara said that the MP had nothing to substantiate his allegations. "We have nothing to do with the attacks against journalists," he said. "If the MP has evidence, he must present it to the police." The BBC's Roland Buerk says that there have been a series of abductions and assaults against journalists in Sri Lanka. Our correspondent says that no-one has been brought to court for the attacks and there are accusations the government has been turning a blind eye, if not encouraging them. Twelve journalists have been killed in Sri Lanka since August 2005, 11 of them in government-controlled areas. In one of the most controversial incidents, a journalist and a senior official of the British High Commission were assaulted last week just days after the government set up a cabinet-level panel to prevent attacks on media personnel. 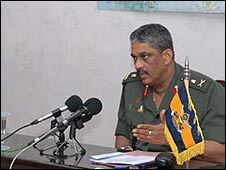 Lt Gen Fonseka hit the headlines in June when he said that the Tamil Tiger rebels had been defeated as a conventional force. He said troops were advancing steadily into the rebel-held north and within a year the Tigers would lose large areas and their control over the population. But he admitted a low-level insurgency could last indefinitely. The general himself narrowly escaped death when a woman suicide bomber targeted him in April 2006 inside the high security army headquarters complex.